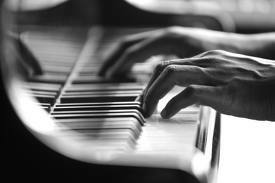 Piano is used in virtually every music genre. EQ is all about what your taste is. How YOU want it to sound. There are some overall tips on what to do to get that sound you want. For a full bodied piano sound boost between 80Hz-160Hz and a tiny boost at 125Hz. For an open and airy piano sound boost between 10kHz - 20kHz and boost 16kHz. For a warmer piano sound boost at 100Hz. For a sharper piano sound boost at 7Khz. For a brighter piano boost at 10Khz. Of course practice and experimenting will get the sound you desire. Also, whenever possible, try subtractive EQ. This is where instead of boosting a signal, you cut the ones around it to make the frequency you want stand out more. Boosting too many signals at once can be a bad thing. Use your own judgement. Want a fuller sounding piano track? One thing to do is pan the piano hard in one direction and put an inverse delay on it, with a super short delay time to make sound very wide. Works like a charm.